A few weeks ago I was sitting in what I sometimes describe (depending on my mood) as my favorite restaurant in the world: Ken’s Artisan Pizza in Portland, Oregon. It’s a tradition my dad, stepmom and I have every time I spend a few days in town; we go to Ken’s on my first night, or my last night, or sometimes both. Sometimes I secretly wish we could eat there all the nights in between too. I love the place that much. If you’ve ever been to Ken’s you surely know why. It’s comfortable and friendly, and everything they make—the vast majority of which comes out of their hulking wood-fired oven, whose warm glow infuses the entire dining room—is spectacular. But this visit to Ken’s was a little different for me. Not because anything was less delicious than usual, but because I found myself doing more than just savoring the interplay between the pizza’s puffy, tender crust and intensely-flavored toppings. This time I was analyzing it, admiring the open-holed structure and polka-dot-like bits of char, wondering what kind of flour Ken uses in his dough, and whether he opts for commercial yeast or a sourdough culture. What hydration level has he settled on, I mused, and what percentage salt? How long does he ferment? It seems my latest project has had more of an impact on me than I thought. Yes, you see, I wasn’t totally honest when I said I didn’t cook anything for six months. I didn’t cook much for six months, but there was one project I was already so deeply involved in that I couldn’t give it up entirely. That project, as you’ve already deduced, was pizza. 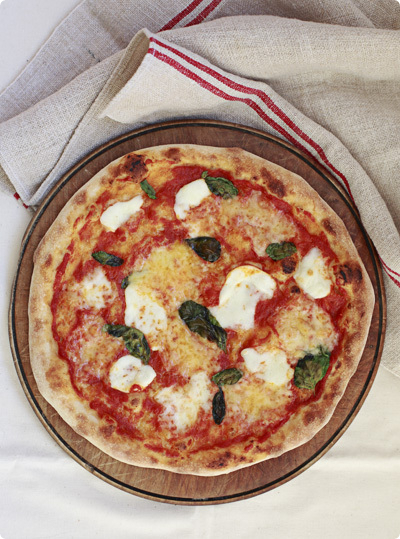 Neapolitan-style pizza, or what in the U.S. is often called neo-Neapolitan, to be exact—thin-crusted pizzas with puffy, chewy rims and a restrained scattering of high-quality toppings. It started about a year ago. I can’t remember if there was something that triggered it, I mean other than my general frustration that the best pizza here in our corner of provincial Germany is what you pull out of the supermarket’s freezer cabinet. It boggles my mind; we’re not even that far from Italy, but in pizza terms we might as well be in Japan. Wait, scratch that—these days even Japan is a better place to be. But as I’m one who likes to see an opportunity in any problem (well, at least when it comes to food), before I knew it I had embarked on a personal mission to develop a recipe for the most excellent homemade pizza this side of the Alps. I knew I couldn’t do real Neapolitan pizza, since that requires a wood-fired oven capable of temperatures in excess of 900F/480C (maybe someday, when we have a backyard…), but I intended to get as close as I possibly could. I won’t bore you with a chronological account of all my pizza successes and failures over the last year, but suffice it to say I know more about the subject than I ever thought I would. I’ve tried just about every different kind of flour, leavener, hydration level, fermentation time, kneading technique and percentage of things like salt and oil imaginable. I mined sites like pizzamaking.com and the Fresh Loaf for the latest tips and tricks, and tried methods touted by everyone from Jeffrey Steingarten to Heston Blumenthal. I learned how to calculate baker’s percentages with my eyes closed. In a fit of insanity I even cultivated a sourdough starter, something I swore I would never do again after my last one died such an agonizing, drawn-out death at the back of my fridge. Frustrated with my oven’s wimpy output, I bought a new one—as well as one of these, which turned out to be fabulous for baking naan and pita, but not so fabulous for pizza, particularly once I discovered how to squeeze a little more heat out of my regular oven. And would you believe it? After all that, I’m still not sick of pizza. Far more amazing, though, is I think I’ve cracked it. I mean, it’s still not the genuine article and it certainly wouldn’t win any contest against a competent pizzaiolo with a pile of burning logs, but for a home-baked pizza it is pretty darn good. Actually, scratch the ‘home-baked’ bit—it’s pretty darn good period. And reliably so; in fact, when I realized that I can’t actually remember my last pizza flop, I decided the time has come to share my project with you. I know there’s more opinions on pizza out there than fish in the sea (particularly these days), and plenty of people have been at it a lot longer than me. But what I’ve come to realize is that pizza is also a dish that’s as much about feeling as it is about formulas, and success is more about figuring out what works best for your unique set of variables (your flour, your oven…) than slavishly following a recipe. That said, of course I’ll give you one. Actually, two. But what I also hope is that even those of you who are seasoned pizza-makers might pick up a new idea or two. And I’d love for you to share your tips and tricks with me in the comments. But first, here’s a summary of the most important things I’ve learned. You need a high-gluten flour for this kind of pizza crust, something around 12-13% protein. In Europe, where flour tends to be much softer, that means adding in extra wheat gluten. I use an all-purpose flour (here labeled 550) with about 10% protein, and add 3g gluten for every 100g of flour. Even with this adjustment, though, the dough behaves differently; European flours need to be worked much longer before the gluten has reached its proper stage of development. I’ve thus written in an extra step for using soft-wheat flour, which involves pulsing the dough in a food processor at regular intervals during the initial fermentation. Yes, you read that right: a food processor makes excellent pizza dough, and prevents the dough from over-oxidizing as it’s mixed. You’ve already heard about delayed fermentation, and it’s as crucial to good pizza as it is to good bread. Using a tiny amount of yeast, a low temperature environment and a long stretch of time results in an astonishingly improved flavor in the finished product. My absolute minimum fermentation time for pizza dough when using commercial yeast is 3 days, though I prefer 4 or even 5 (longer than that and the gluten can start to break down). This is easy to work into your schedule when you have a regular pizza day. Say you make pizza every Saturday, then you just mix up the dough on Monday or Tuesday and let it age in the back of the fridge all week. That said, the single biggest thing you can do to improve your pizza is to cultivate and maintain a sourdough starter. The differences are astonishing: a sourdough crust is even more deeply flavored, it’s chewier and airier, it’s easier to digest (I never have the rock-in-my-belly feeling after sourdough pizza) and develops flavor much more quickly than dough made with commercial yeast. In fact, an overnight fermentation is all you need, and I’ve even made same-day sourdough pizza that was surprisingly great. Cultivating a starter is also dead easy; I followed Susan’s brilliantly straightforward method, and within a little over a week I had a 100% hydration starter raring to go. This is really a simple, foolproof starter and so is its maintenance (I keep mine refrigerated and thus only need to feed it once a week). After struggling with Nancy Silverton’s complex and cryptic method a few years ago I never thought I’d bother with sourdough again; now, I can’t imagine life without a culture in the fridge. Please, please, please invest in a digital scale if you don’t have one already, and familiarize yourself with baker’s percentages. They’re really not hard (they just tell you the ingredients’ percentage relative to the flour), and this allows you to scale your pizza recipe up and down with ease, as well as make fine adjustments to things like hydration and salt levels. Speaking of hydration levels, this is the variable I’ve toyed with the most. What seems to work best for me is a hydration of about 65%, which is firm enough to handle and shape without difficulty, but has enough moisture to prevent it from drying out and getting ‘crackery’ in a home oven. Unless you’re trying to impress your friends, I don’t see any reason to fuss around with a pizza peel. Use parchment paper instead. Parchment is a miracle where pizza is concerned: you shape and top your dough directly on it, transfer the whole thing onto a baking sheet or cutting board and from there it slides effortlessly into the oven. 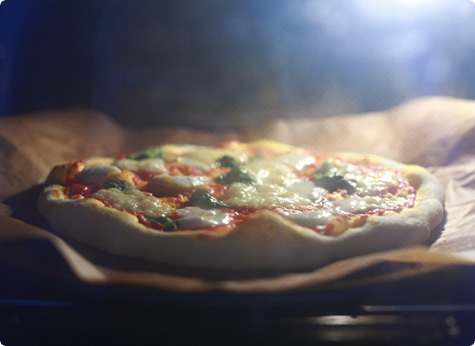 The pizza bakes beautifully on it, and as soon as the crust is set the paper can be easily slipped out from underneath. I can’t tell you how much easier this is than struggling to transfer a fragile crust onto a pizza peel and then jerking and shaking it onto your stone; every time I’ve tried this I’ve ended up with a misshapen pizza and more toppings on the floor of my oven than on the dough. Yes, I’m probably extraordinarily clumsy and yes, peels are what the professionals use, but they have ovens at temperatures that would simply incinerate paper; at least on this one count we home cooks have the advantage. Speaking of pizza stones, what I recommend is not a stone at all—it’s a cast iron plate. I can’t tell you how glad I am that I lugged this thing back to Europe with me. It gets ferociously hot, bakes evenly, and you’ll never have to worry about it breaking (which is the fate all my stones have met). Of course lacking access to one of these, a stone will do just fine. Everybody says it, and I’ll repeat it: don’t, don’t, don’t overload your pizza with toppings. Too many and the whole thing will take too long to bake. Result? The dreaded leathery and/or crackery crust. A good rule of thumb is no more than 100g (3.5oz) cheese, and no more than a handful (total volume) of any other topping(s) you desire. Also, cube your cheese rather than grating; this leaves large patches of sauce exposed and helps more liquid to evaporate. In other words, pizzas that are less watery and more intensely flavored. And finally, here’s what I’ve found to be the most successful technique for squeezing the maximum heat out of a home oven (that is, without cutting off the lock and running it on the cleaning cycle!). All you need is an oven equipped with a broil or grill function in the main chamber*. First, contrary to what a lot of the pizza baking advice says, don’t position your stone near the bottom of the oven. Position it near the top, ideally about four to five inches (10-12cm) below the element. Preheat your oven on its highest setting for 60 minutes. Then, just before you slip your pizza in, switch it to broil. Put your pizza in and then watch carefully; the combination of the superhot stone and intense heat from above will cause the pizza to cook in just a few minutes. In case the top starts to over-brown (or heaven forbid, burn) before the crust is done, just switch back to bake, or even switch it off completely. The stone’s residual heat will take care of the rest. *If you have it in a separate chamber, you can always try the Heston Blumenthal-inspired skillet-broiler method. I know, this isn’t a purists’ margherita, but I’ve never claimed to be a purist of any kind. Despite my embellishments, though, it still retains its trademark simplicity and exquisite harmony of sweet tomato, spicy basil and buttery cheese, just with a little more depth. On the subject of cheese, do splurge on something good—you use so little of it that every bite needs to count (and at these amounts nothing is that expensive anyway). You’ll notice there are two crust options here. The sourdough crust is the one I make almost exclusively by now, so if you happen to have a 100% hydration starter on hand, you’re good to go. For everyone else I’ve included my regular-yeast version—just note the considerably longer fermentation time, and plan your pizza activities well in advance. I know, it’s tough. But so worth it. Oh, and yes, nearly all the measurements here are in metric weight. I wasn’t kidding about buying a scale! For the commercially-yeasted crust, pulse flour (with gluten, if using), yeast and sugar in the food processor. With the machine running, add the water and process just until a cohesive dough forms. Let sit, covered, for 20 minutes. Pour in the salt and oil, switch on the machine, and process until the dough is smooth and forms a ball around the blade, about 30 seconds. Let sit, covered, one hour*. Remove the dough from the processor, knead lightly on an oiled surface a few times, place into a large oiled bowl or container, cover tightly and refrigerate. Store in the back of the fridge for 3-5 days (the longer the better) before using. *If using European flour with gluten added, process briefly (~5 seconds) every 15 minutes during this hour, for a total of four times. For the sourdough crust, pulse flour (with gluten, if using) and sugar in the food processor. In a separate bowl, stir together the starter and water until the starter has dissolved. With the machine running, pour in the liquid and process just until a cohesive dough forms. Let sit, covered, for 20 minutes. Pour in the salt and oil, switch on the machine, and process until the dough is smooth and forms a ball around the blade, about 30 seconds. Let sit, covered, two hours*. Remove from the processor, knead lightly on an oiled surface a few times, place into a large oiled bowl or container, cover tightly and refrigerate. Refrigerate overnight, or for up to two days. *If using European flour with gluten added, process briefly (~5 seconds) every 30 minutes during these two hours, for a total of four times. Prepare the toppings. For the sauce, drain your tomatoes in a sieve. Remove any stray bits of skin, then, one at a time, gently squeeze the tomatoes to help them release as much liquid as possible. If this causes them to burst and expel watery seeds, so much the better. Process the drained tomatoes along with the rest of the sauce ingredients in a food processor until smooth. Alternatively a deep bowl and an immersion blender work great too. 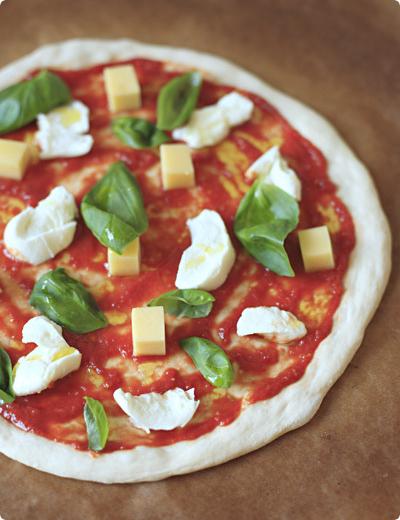 If using fresh mozzarella, tear it into rough chunks and set these on a double thickness of paper towels to drain. Cut firmer cheeses into 1/2-inch (1cm) cubes. Remove basil leaves from their stems. Shaping, topping and baking. About two hours before you want to bake the pizzas, remove the dough from the fridge. Divide the dough in half and shape each half into a ball, pulling the surface skin taut and pinching it together underneath. Set the balls a few inches apart on a lightly floured surface, dust with flour, and cover with a clean kitchen towel. Let rest for 60-90 minutes. Meanwhile, about an hour before you think you’ll be ready to bake, place your stone or plate in the upper part of your oven (about four to five inches/10-12cm from the top element) and preheat to its maximum setting. Prepare two squares of parchment paper. Dust one of the dough balls with flour and lay it in the center of a parchment square. Using the flat underside of your fingers, gently press the dough into an 8-inch (20cm) disk, leaving the outer edge slightly thicker than the center. Now taking care not to tear the dough, gently stretch the dough into an approximately 12-inch (31cm) round, working along the edges and giving the dough quarter turns as you stretch. Another good technique is to pick up the pizza by its edges and keep turning it, letting gravity pull the dough down. If it tears anywhere, just pinch it back together, and if it sticks to anything, dust it with a little more flour. When you have a more or less round crust lying on your parchment, trim the paper around it so that it’s only a little larger than the pizza. Prick any large bubbles you see around the dough’s outer edge—these will just burn in the oven. Lay a towel over the crust and repeat with the other dough ball. Using the back of a spoon, spread half the tomato sauce (about 1/2 cup (125ml)) in a thin layer over the surface of one crust, leaving 1/2-inch (1cm) border around the edge. Scatter half the cubed cheese over the sauce, and lay a few whole basil leaves among the cubes. Drizzle 1 tablespoon of olive oil in a spiral pattern over the top. Switch your oven to broil. Using a pizza peel, cutting board or the back of a baking sheet, transfer the topped pizza (still on its parchment) to the oven and slide it onto your stone. Close the door and let it bake for four to five minutes, or until the crust has puffed and set. Working quickly, open the door and insert a spatula between the pizza and parchment paper. Pull out the paper (it’s not that hot, so you can use your bare hand) and close the door again to let the pizza finish baking, about another three to five minutes (if you forget to remove the paper it’s not a big tragedy, the bottom just doesn’t brown quite as deeply). When the topping is bubbling and the crust is golden, remove the pizza from the oven using a peel or a couple of spatulas. Transfer to a wire rack to cool for a couple of minutes before slicing and serving. Top and bake the second pizza in the same way. You’ve heard of Sanjeev Kapoor, right? You know, the author of more than three dozen cookbooks, host of Asia’s longest-running cooking show (actually, television program of any kind! ), owner of multiple restaurants and brains behind the eponymous website that registers 25 million hits per month? Well, to be honest, if you’re not Indian I’m not surprised, since despite his mammoth fame and fortune in his own country he’s all but unknown abroad. That’s all set to change, though, thanks to the release of his very first cookbook for the western market: How to Cook Indian (aka Mastering the Art of Indian Cooking in the UK), published earlier this year by Abrams. Before I tell you about the book, though, I have a confession to make. This isn’t the first I’ve heard of Sanjeev. In fact, I’ve been a closet fan of his for more than a decade. Not only that, but I owe most of my Indian cooking skills to him. That’s right, Sanjeev Kapoor taught me far more about cooking Indian than people like Madhur Jaffrey, Julie Sahni or any of the other subcontinental names on my bookshelf. That’s because at the time I discovered Sanjeev, I didn’t have any of those books. What I did have circa 2000 was a huge passion for Indian food, and an even huger frustration that my attempts to cook it always ended in mediocrity. Regardless of what I tried to make, Indian food in my hands always ended up tasting like, well, something attempting to taste Indian. It probably didn’t help that the one ‘authentic’ Indian cookbook I owned was written by Hari Krishnas, who eschew onions and garlic for religious reasons, and let’s not even talk about the majority of western recipes, with their reckless use of bottled curry powder and Major Grey’s mango chutney. Eventually in my quest to unlock the secrets of Indian cooking I turned to the internet. Today, of course, that would be no problem; anyone wanting to learn more about Indian food need only tune into the thousands of Indian food blogs, forums and videos out there. In those days, however, finding reliable information on exotic cuisines was a bit like looking for a needle in a haystack. Imagine my surprise, then, when I stumbled upon Sanjeev Kapoor’s website, a seemingly bottomless repository of recipes for everything from lassis to kebabs written by a well-known Indian chef for an Indian audience. It didn’t take me long to realize I’d hit the jackpot. Naturally there were some hurdles to overcome in using Sanjeev’s recipes, such as his casual use of Hindi names for many common Indian ingredients. I simply had to learn that elaichi means cardamom, dhania is coriander and curd refers to yogurt. Some techniques were foreign to me too, such as grinding things into pastes, but I just put my blender to work and hoped for the best. The trickiest thing was finding where to buy all these strange new ingredients. But oh my, the effort was worth it. His recipes were phenomenal, producing Indian food to rival the best we’d ever eaten. It was a lot of work, granted—particularly since I was struggling to adapt western a kitchen to Indian tasks—but the flavors were bigger, deeper and more sophisticated than I thought I’d ever find coming out of my own kitchen. And what was even more valuable than the recipes themselves was the know-how I gleaned: how much richer garlic and ginger taste when they’re blended to a paste before being sautéed, how much more fragrant whole spices taste than dusty powders, how frying aromatics in a little oil and stirring it in to a dish right before serving unlocks untold depths of flavor. This was the key to Indian cooking, and I took it all greedily on board. Even after I began collecting Indian cookbooks from other authors I kept using Sanjeev’s website, often checking other versions of a dish against his, or just looking for something new and inspiring. With him I knew I was always getting the real deal, not something watered down for western tastes or dietary sensibilities. You can imagine, then, how thrilled I was to hear he was writing a cookbook for the western market. Finally, I’d have all my favorite Sanjeev Kapoor recipes on paper! No more mustard seeds splattering all over my computer screen! I even knew immediately which recipe I’d share with you: his Murgh Makhani, butter chicken, which with its succulent home-roasted tandoori chicken with an addictive tomato-honey-cream sauce ranks among the best versions of this classic dish I’ve eaten anywhere. We actually started eating the butter chicken almost weekly in anticipation of the book’s release, and of course so I could perfect the recipe. When the book arrived, though, I could hardly believe my eyes: the butter chicken recipe inside was substantially different from the one I’ve been making for years. Not only was it missing several key ingredients, several others had been scaled back so drastically I wondered how this could possibly be the same dish. Further reading confirmed what I feared: this book has been heavily adapted for its new market. Some of the adaptations were no doubt necessary, as western kitchens are simply not outfitted with the same equipment as Indian kitchens and new techniques had to be devised. Other adaptations, at least from my perspective, are not so welcome: spice mixtures have been simplified, heat has been toned down, pungent aromatics like garlic and ginger have been reduced, and quantities of high-calorie ingredients like butter, cream and nuts have been slashed across the board. While I’m sure the results are still good, I can’t help feeling the publishers have underestimated their target market in assuming that people who go out of their way to buy Indian cookbooks can’t handle real Indian flavors (or calorie counts). At the very least a range of options could have been provided so that people would have the choice to make a dish pungent or tame, spicy or mild, rich or lean. Overall, then, I have to give this book a very mixed review. For die-hard Sanjeev Kapoor fans it’s going to be a disappointment, what with all the trimming and toning down of his tried-and-true recipes. 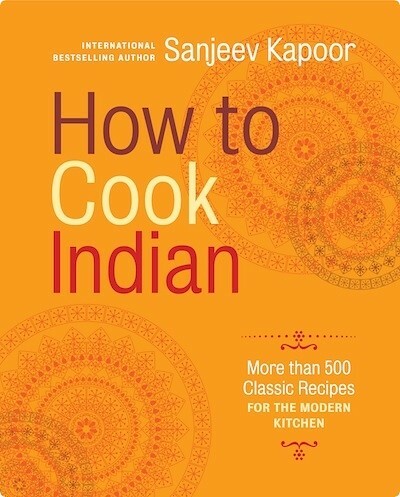 Lacking extensive information on ingredients, techniques, culture and history it’s also probably not a good beginner’s tome; if you’re looking to learn the basics of Indian cuisine I’d start elsewhere, like Julie Sahni’s Classic Indian Cooking. That said, for people who are already reasonably comfortable cooking Indian food, are confident enough in their ability to tweak things to their tastes and are ready to expand their horizons, I’d say this is a great addition to a cookbook library. The scope alone is massive, containing more than 500 recipes for everything from classics to Sanjeev signatures, and I have enough faith in him to know that even in their tweaked form his recipes are bound to impress. And of course you can always cross-reference things with his website to see what might have been changed and how. That’s certainly what I’ll be doing. 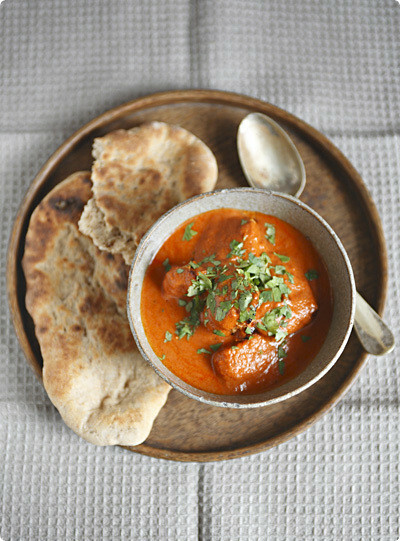 But with the butter chicken, at least, you won’t have to. Here’s my adaptation of his original recipe, rich with cream and honey, spicy with chilies and studded with chunks of aromatic, charred-around-the-edges tandoori chicken. I guarantee it’ll make a fan out of you too. One of the most popular dishes both in India and in Indian restaurants abroad, butter chicken’s origins are murky, with some people claiming it’s the evolution of a traditional Punjabi dish, others claiming it was invented in the 1950s in a tandoori restaurant in Delhi, and still others that it was invented in restaurants abroad and re-exported to India. Whatever the truth, it’s popular for a good reason. Try serving it to someone who claims they don’t like Indian food and see how quickly they change their mind. There are a couple of ingredients here that you might not have on hand unless you cook a lot of Indian food. If you can’t track down dried fenugreek leaves (called ‘kasoori methi’ and usually available with the spices in Indian markets), you can substitute a pinch of ground fenugreek seeds for a similar flavor. Likewise the mustard oil is definitely optional, but it does give another layer of flavor to the chicken. And speaking of chicken, my vote here is definitely for dark meat, since it remains much more moist and tender. That said, I’ve successfully made this with white meat too—just make sure not to overcook it either in the oven or in the sauce. As far as techniques go, do take the time to make garlic and ginger pastes as opposed to just mincing; it’s really easy to do with a mortar and pestle or else try my preferred tool, a fine Microplane grater. One final note: this sauce is really versatile. You can easily make a vegetarian dish out of this by substituting cubes of paneer or your favorite vegetables for the chicken. Shrimp works great too. In a medium bowl combine the chicken pieces with chili powder, lemon juice and salt and set aside for 30 minutes. Stir in all the marinade ingredients except the butter, mixing well to ensure the chicken is well coated. Cover and refrigerate for three to four hours (overnight is fine too). Preheat the broiler or oven to its maximum setting. Thread the chicken onto skewers (4-5 pieces per skewer) and place in a single layer on a baking sheet lined with well-oiled aluminum foil (I’ve also done it without skewers, but they make turning the chicken easier). If using the oven, position a rack near the top. Roast, turning once or twice, for 8-10 minutes, basting about halfway through with the melted butter, until the chicken pieces are just cooked through and speckled around the edges with black. When cool enough to handle, remove the chicken pieces from the skewers and set aside. To make the sauce, melt the butter in a heavy-bottomed pot. Add the cardamom, cloves, peppercorns and cinnamon and sauté for two minutes. Add garlic and ginger pastes and chopped green chillies, and cook, stirring, for one minute more. Add tomato puree, chili powder, garam masala powder, salt to taste and one cup of water. Bring to a boil. Reduce heat and simmer for 10-15 minutes, until slightly thickened. Add 2 tablespoons honey, powdered fenugreek leaves and cream. Simmer 10 minutes more or until sauce has thickened again. Adjust seasoning, adding more salt to taste and cayenne pepper for additional heat. Fish out the whole spices if you like (I never bother). Add cooked chicken pieces and simmer just to heat through. Serve hot, sprinkled with chopped cilantro and accompanied with flatbread or rice. *Dried fenugreek leaves usually come whole; to powder them toast in a dry skillet or in the oven until crisp, then rub between your fingers. Note: I received this book as a complimentary review copy from Abrams Books.